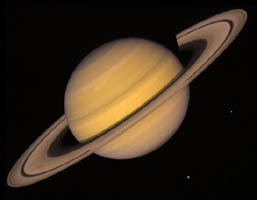 The second largest planet in the solar system, Saturn is a "gas giant" composed primarily of hydrogen and helium. But it's best known for the bright, beautiful rings that circle its equator. 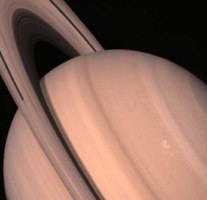 The rings are made up of countless particles of ice and rock that each orbit Saturn independently. Saturn also has more than thirty known moons. The planet can be seen from Earth with the unaided eye, but a telescope is needed to see the rings. Sixth planet from the Sun. Average distance is 9.54 AU, or 9.5 times the distance of Earth from the Sun. Second in size only to Jupiter. Diameter at the equator is 75,000 miles (120,000 kilometers), about 10 times the size of Earth. Least dense of all the planets. It would float in water. Hot interior (about 21,000°F or 12,000°C at the core), and gives off more energy than it receives from the Sun. There are seven named rings, but they are made up of thousands of ringlets. A Saturnian year is about 29.5 Earth years. 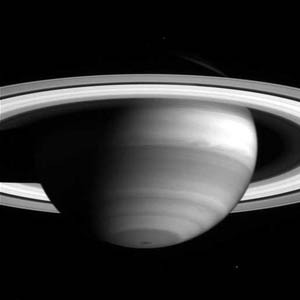 A Saturnian day is about 10 Earth hours.